Santa arrived early this holiday season at Emory Saint Joseph's Hospital, as employees demonstrated their generous spirit of giving by supporting those in need during the hospital's annual Christmas Giving Festival and Coat and Blanket Drive. For several decades, these two longstanding traditions have embodied the mission and values of the hospital, which are caring for the poor, vulnerable and those needing assistance. Hospital departments and units came together to provide nearly $25,000 in gifts for families facing challenging times during the Christmas Giving Festival as well as donating several hundred items for the Coat and Blanket Drive. "This year, the hospital adopted 54 families, some associated with Mercy Care, and others with Emory Saint Joseph’s," says Scott Mathewson, manager of Non-Invasive Cardiology and Cardiology IT and coordinator of the Festival. On Dec. 22, a truckload of wrapped presents, including toys, clothing, electronics, gift cards and bicycles, were donated to Mercy Care, a non-profit organization providing primary medical care for the homeless and underserved. Mercy Care was founded after teams of Saint Joseph’s doctors, nurses and staff began providing medical care on the streets, in homeless shelters and in soup kitchens. In addition to the Christmas Giving Festival, the hospital also hosted a Coat and Blanket Drive. Collection boxes were placed at various hospital entrances, and Emory Saint Joseph’s employees donated coats, scarves, blankets, hats and gloves, which were then distributed during Mercy Care’s Memorial Service held in remembrance of those who died on the streets of Atlanta during the past year. 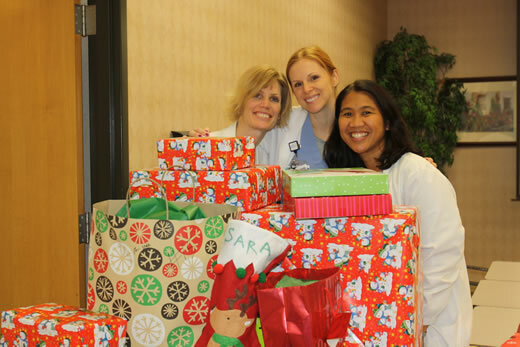 "Our Emory Saint Joseph's staff celebrated the holiday season with such incredible contributions," says Jeanne Landry, vice president of Human Resources at Emory Saint Joseph’s Hospital. Not only do our employees care for the vulnerable every day in our hospital, but this is also a wonderful example of them continuing the hospital’s mission and making a difference in the community."